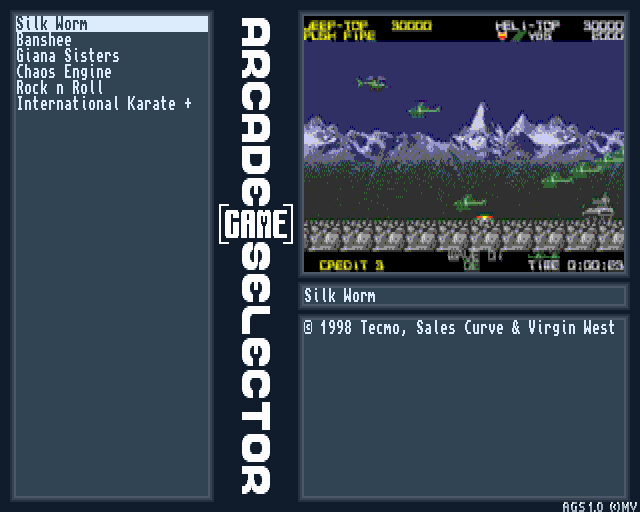 AGS is a joystick controlled menu program for the Amiga. It requires a joystick in port 2 and an AGA Amiga. Save the script to S:Startup-Sequence and you have a dedicated game machine. As just a list of filenames would be a bit too bland AGS loads a background image called AGS:SelectorBKG.iff. It should be a 640x256x8 bit ILBM. For each game AGS looks for a .txt and a .iff file with the same base name. name.iff should be a 320x128x8 bits image using the same palette as the background image. name.txt should be a text file with max 40 characters per line and 12 lines of text. The first line will appear by itself and should contain the full title of the entry. The 11 following lines are printed in the info box below. AGS 1.0.1 and some example files. Double-click on AGS to run the test script. Make it OCS/ECS compatible, ability to choose a different screenmode, arbitrary placement and size of screen elements, config file. Oh, and get a real screenshot instead of that old mockup up there. Fixed wrong game being selected when you had more than 30 entries. Fixed lockup when having more then one start script starting with the same letter. AGS is written in AmigaE. 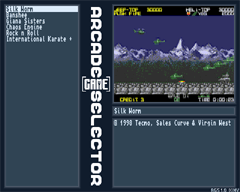 The source needs to be cleaned up and commented but in case you want to look at it anyway, here it is: arcadegameselector.e.